A woman uses the ATM at a branch of Raiffeisen Bank in downtown Bucharest in this picture taken June 5, 2013. Shares in Austria's Raiffeisen Bank International and two Dutch banks, ING and ABN Amro, fell on March 5 after media reports about a money-laundering network that was alleged to have channelled billions of euros from Russia. The share price falls followed a report by a collective of European news outlets, called the Organized Crime and Corruption Reporting Project (OCCRP), which was based on what it said were leaked documents detailing transactions worth more than $470 billion sent in 1.3 million transfers from 233,000 companies. Austrian anti-corruption prosecutors said on March 5 they were examining money-laundering allegations after receiving a complaint against unknown parties. 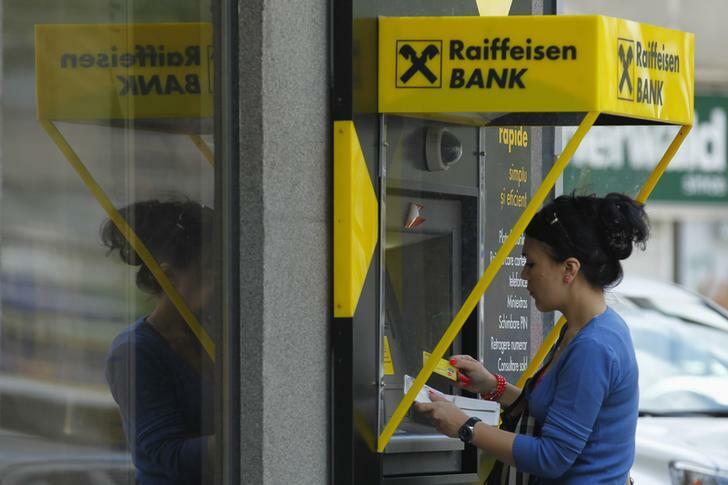 Raiffeisen Bank International said in a statement that it "is not familiar with the concrete allegations and does not have any further information on the content of the complaint". The bank added that it was conducting an internal investigation. Dutch magazine De Groene Amsterdammer, part of the OCCRP collective, alleged that Dutch banks ING and ABN Amro and unlisted Rabobank had facilitated several hundred million euros in improper payments. Shares in Raiffeisen were down 12 percent by 1500 GMT on March 5, while those in ING and ABN Amro were down by 3.7 percent and 1.7 percent respectively.